Celebrating the life of Theodore C. Ashbeck Sr.
Be the first to share your favorite memory, photo or story of Theodore. This memorial page is dedicated for family, friends and future generations to celebrate the life of their loved one. Obituary for Theodore C. Ashbeck Sr.
Theodore Carl Ashbeck Sr., died peacefully at ThedaCare Medical Center-Waupaca, WI on April 6, 2019. He was born on September 8, 1938 to Theodore Herman George and Anne May (Adams) Ashbeck of Wabeno, WI. Ted led a full and active life. He worked many different jobs throughout his life. They include construction work, Wisconsin Public Services, Acme Tree Services, and as a lumberjack. 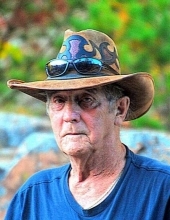 He also was an outdoors man who enjoyed and respected nature. In his later years he was able to travel and explored areas of the south western parts of America. His passions included exploring and panning for gold in New Mexico and finding treasures at estate sales and auctions and watching NASCAR on Sundays; he was a huge fan of racing. Ted is survived by three brothers; Albert (Joyce) Ashbeck of MI, Tom Ashbeck of GA and Michael Ashbeck of WI; and six children; Lawrence E. (Cindi) Ashbeck of WI, Elizabeth A. (William) Mancl of WI, Janice E. Seager of Netherlands, Lisa M. (Daryl) Kliment of WI, Theodore C. (Pamela) Ashbeck of WI and Curtis M. (Carmelita) Ashbeck of WI. Ted is further survived by 15 grandchildren, 32 great-grandchildren and several nieces and nephews. A Memorial Service will be held 11:00 a.m., Friday, April 12, 2019 at Boston Funeral Home with Rev. David E. Ficken presiding. A visitation will be held on Friday from 9:00 a.m. until the time of service at the funeral home. Burial will be held at a later date. To send flowers or a remembrance gift to the family of Theodore C. Ashbeck Sr., please visit our Tribute Store. "Email Address" would like to share the life celebration of Theodore C. Ashbeck Sr.. Click on the "link" to go to share a favorite memory or leave a condolence message for the family.